As a high school teacher, it can sometimes be challenging to convince students to spend their time reading instead of on their phones or in front of the tv. Me? I'll take a good book any day! Therefore, I try use my love of reading to convince my students to feel the same. Over the past year or two, my husband and I have found that if we keep water in the fridge (bottled or in a pitcher), that we drink a lot more water. It's easily accessible, so I grab it and use it. Many people that eat healthy will tell you the same thing: make the good choices accessible. So this is what I've decided to do in my classroom too. I'm going to use every possible available space to display a variety of books. 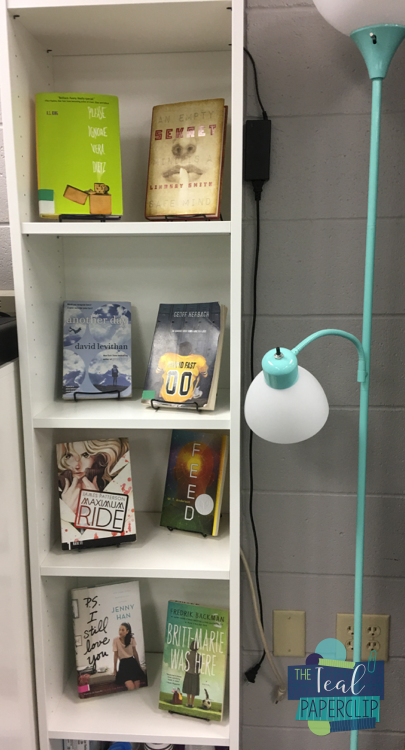 I'm hoping that if my students are surrounded by new books all the time that they'll be tempted to grab one. The first place I decided to display books is on my whiteboard marker holder. It's always at the front of the room, and it's the first place my students look when they come in. I've seen elementary and primary teachers do this with picture books, so I thought, "I can do that with novels too!" I'm probably going to write captions or short enticing phrases above the books to try to convince students to check them out. The next place I set up a display is on the storage shelves that line the wall beside my door. The first shelf has all of my students' handouts for the day on it. I had a ton of stuff randomly piled on this one and thought I could clean it off and use it for room to display more books. Win! I love that I can put so many books here, and they become a centerpiece for this shelf. 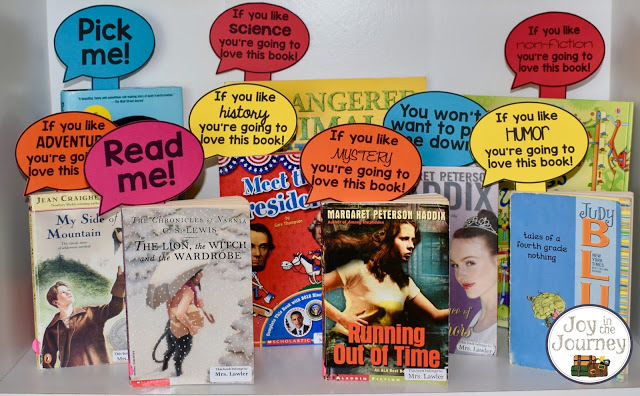 I love this idea from Joy in the Journey to use book recommendation speech bubbles! These are FREE AND EDITABLE. Jackpot! 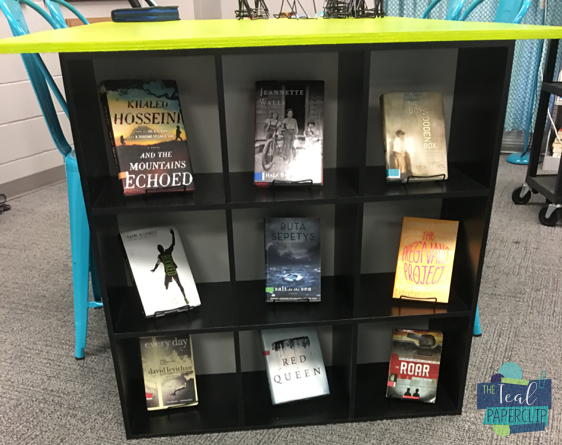 I think these will be great for those free standing books that aren't on the whiteboard tray. This bookshelf was tucked off in a corner. It was loaded with junk. I can say that because it was mine: empty binders, half-used storage drawers, and a tablet that was never charged. Yuck. It needed a new life. Book display it is. I cleaned off all of the junk, moved my dictionaries and thesauruses to the bottom shelf, and tosses some book display thingamabobbers on it. Done. I love how this turned out! This is actually the area on top of my student notebook storage. I think primary and elementary teachers call them mailboxes, but we use ours to house our notebooks, folders, and books since I don't have desks. I previously had a bookmark jar, a box of play dough, and some random fake plants. Bleh. Book display was a much better use of this space. 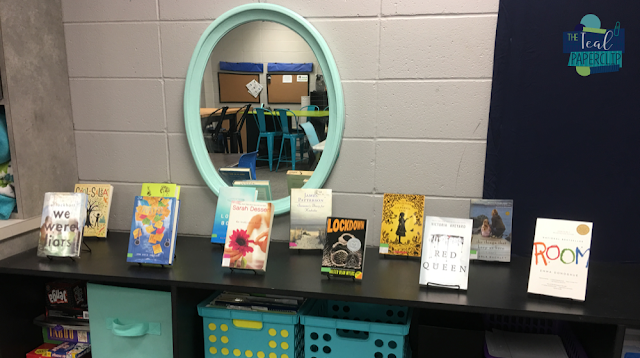 I put these books up a week or so before the end of the school and had a student to ask if she could check one out before the end of the first day that they were there. I'll take it! This next picture is actually the end of one of my flexible seating tables. I didn't do a very good job of utilizing this space last year, so I'm definitely going to do a better job this year. Books, books, glorious books. See where I'm going? 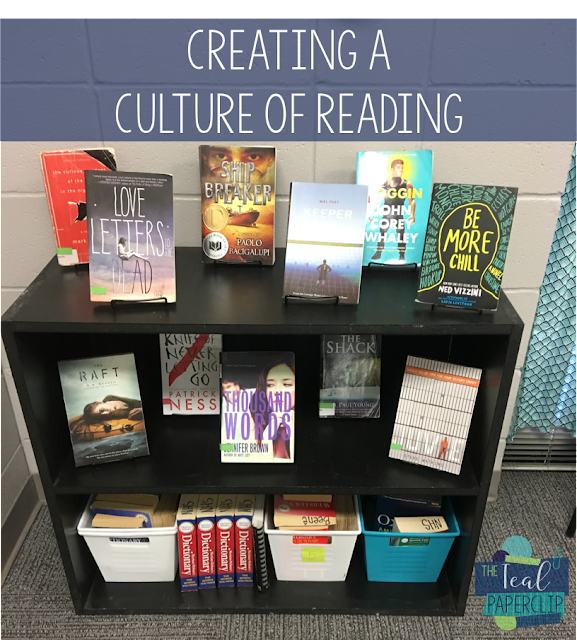 Now that you've seen my display ideas, here are so things I want to do with them to help further the culture of reading in my room. 1. We already read for 15-20 minutes at the beginning of every. single. class. Always. I've found that this really helps develop that love of reading when they don't have to give up "their" time. 2. I want to create a book recommendation board. I've got the perfect spot for it. There's a cork board at the back of my room. 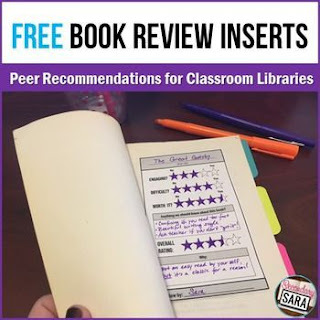 I think that I can slap a cute sign on it and let my students use sticky notes for their recommendations. 3. 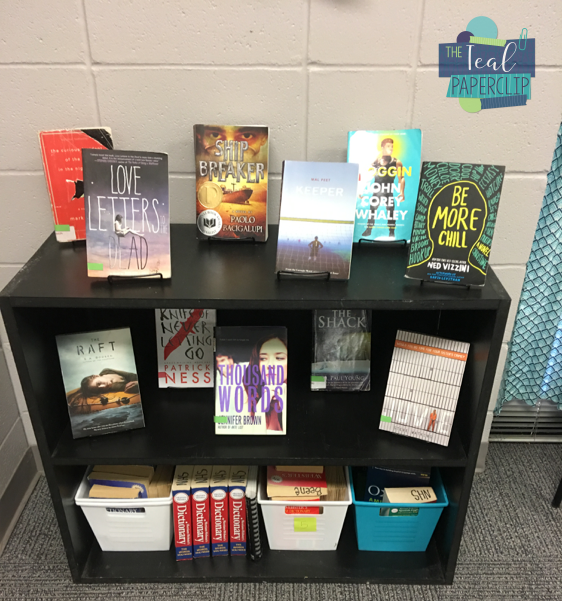 I want students to change out the display books. If they read a book that isn't on display and love it, I want to give them the opportunity to replace a book that's on display that hasn't gotten much love. 5. I think that I also want to have students do short book talks once a week on a rotating basis. This helps them with speaking and listening skills and helps get the word out about good books. Do you have any other suggestions for how to create a culture of reading? Also, be sure to leave any good book suggestions in the comments too! I'm always on the lookout for a good book. I can't wait to hear from you! This looks great! Where do you get the funding/money to pay for all of these books? A variety of ways. My principal pays for some of them out of a portion of the budget that is set aside for classroom libraries. I pay for quite a few of them out of my pocket. I buy from used bookstores, goodwill, and thriftbooks.com. I also encourage my students to donate books that they're no longer reading at home for bonus points.